“Mary took a pound of costly perfume made of pure nard, anointed Jesus’ feet, and wiped them with her hair. The house was filled with the fragrance of the perfume.” (See John 12: 1-11 NRSV). In Psalm 36:5 the Psalmist proclaims “Your love, O Lord, reaches to the heavens, and your faithfulness to the clouds.” I think Mary knew and experienced that love in a most profound way. Her action of washing the feet of Jesus, drying them and anointing them was her way of celebrating that love. Her service to Jesus was symbolic of what she knew intimately within the whole of herself. Contemplative prayer is an action of love by God, inviting us to experience that love. It is a love that is so profound that all we can do is be in the presence of God, and surrender everything we are and have to that presence. It is a fragrance that touches our senses with experiences we cannot explain or describe. We can only know that presence and live into it. Where in your life are you experiencing the fragrance of God’s love this Holy Week? If you or someone you know could benefit from Spiritual or Grief Companionship, please go to my website here. 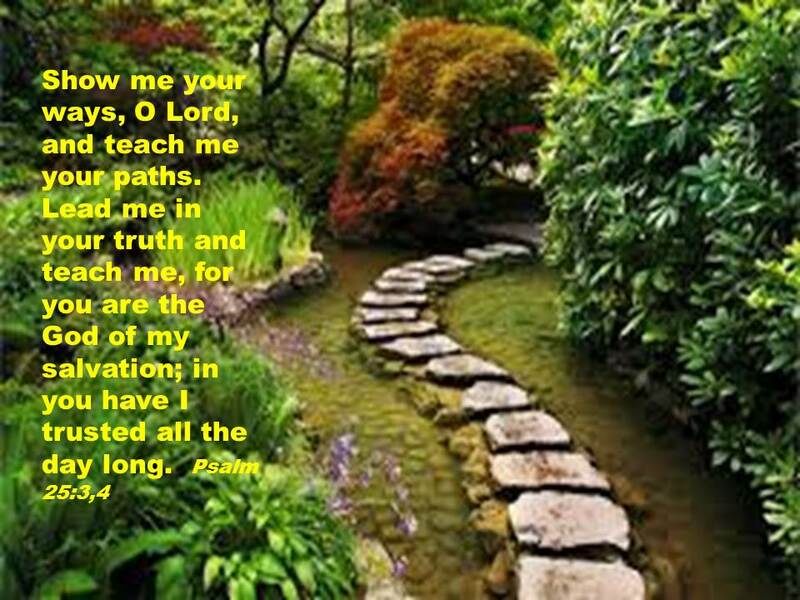 Show me your ways, O LORD, and teach me your paths. Lead me in your truth and teach me, for you are the God of my salvation; in you have I trusted all the day long. 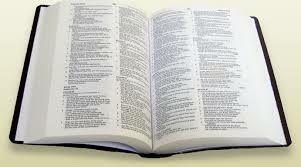 (Psalm 25:3,4 The Book of Common Prayer). In The Rule of St. Benedict, chapter 7 on Humility, he writes about steps two and three. Step two, Benedict writes is about not loving our own will; while step three is about being obedient to our Superior. Why are these so difficult to comprehend much less do today? It is because we live in a society where self sufficiency is the name of the game. If you cannot do it all by yourself, there must be something wrong with you. There is also the matter of how we define the word freedom. Freedom is defined by our contemporary society as being able to do as we please, without being accountable to anyone. Is it any wonder that wealth, power, consumerism and the stewardship of the earth’s many valuable resources are so out of control? St. Benedict challenges us with these words about not loving our own will and being obedient to another, because we were created to live in community with one another. It is much too simple to do our daily devotions, go to Mass, engage in conversation about the Scriptures; and still miss the mark of what living the Christian life is about. Sr. Joan Chittister, OSB probably wrote it best in The Rule of Benedict: A Spirituality for the 21st Century. It is so simple, so simplistic, to argue that we live for the God we do not see when we reject the obligations we do see. Benedictine Spirituality does not allow for the fantasy. Benedict argues that the third rung on the ladder of humility is the ability to submit ourselves to the wisdom of another. We are not the last word, the final answer, the clearest insight into anything. We have one word among many to contribute to the mosaic of life, one answer of many answers, one insight out of multiple perspectives. Humility lies in learning to listen to the words, directions, and insights of the one who is the voice of Christ for me now. To stubbornly resist the challenges of people who have a right to lay claim to us and an obligation to do good by us–parents, spouses, teachers, supervisors–is a dangerous excursion into arrogance and a denial of the very relationships that are the stuff of which our sanctity is made. Rungs one and two call for contemplative consciousness. Rung three brings us face to face with our struggle for power. It makes us face an authority outside of ourselves. But once I am able to do that, then there is no end to how high I might rise, how deep I might grow (pages 84-85). O God, you are my God; eagerly I seek you; my soul thirsts for you, my flesh faints for you, as in a barren and dry land where there is no water. Therefore I have gazed upon you in your holy place, that I might behold your power and your glory. (Psalm 63:1-2, The Book of Common Prayer, p.670). Just before I began writing this blog post, I did a search on Google for an image of searching. The only images I could find were copied and pasted images of a Google search engine. LOL. So, I settled for what I used above the Scripture verse for today. I chose it because the verse from Psalm 63 speaks of searching for God eagerly with a firm faith that God is the One who quenches our thirsting souls. 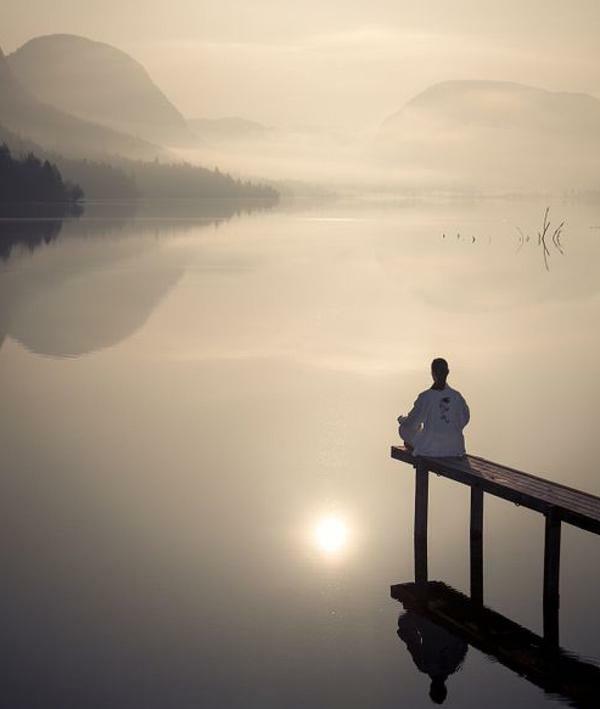 The picture is of a person sitting on a dock looking out at a foggy body of water, with very little visibility. What inspires me is that the one sitting there views all of it with beauty and hopeful expectation. We do not always get to chose the moment or environment in which to search for God. Most circumstances are beyond our control. Yet, those moments are opportunities to search for God beyond what we can see or understand; so that God can give us a new perspective. Each opportunity for a new perspective widens our vision of God in what is invisible. It is experienced and lived; even if it isn’t something that can be touched or comprehended. Today, right where we are, whatever we are doing or experiencing; God is searching for us more than we are for God. Sr. Joan Chittister, OSB often writes, “We are seeking God, who has already been found.” God is already deep in our hearts, longing to be loved and held; only to become the most pure expression of who we really are. God’s Beloved, with whom God is well pleased. On the subject of the prayer of Jesus that “we all may be one”, Abba Isaac in the Tenth Conference on Prayer, in The Conferences by St. John Cassian said, “This will be the case when every love, every desire, every effort, every undertaking, every thought of ours, everything that we live, that we speak, that we breathe, will be God, and when that unity which the Father now has with the Son and which the Son has with the Father will be carried over into our understanding and our mind, so that, just as he loves us with a sincere and pure and indissoluble love, we too may be joined to him with a perpetual and inseparable love and so united with him that whatever we breathe, whatever we understand, whatever we speak, may be God (pages 375-376). I am reading through the Tenth Conference on Prayer in The Conferences by St. John Cassian as part of the Office of Matins. 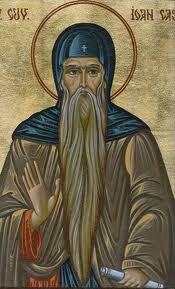 For those who have never heard of St. John Cassian, you can read about him here. For the purposes of this blog post, the one thing I will share with you is that the majority of what St. Benedict learned and wrote in The Rule came from the inspiration of St. John Cassian’s Conferences and The Institutes. The words I just quoted above, sort of leaped out at me at Matins yesterday. Just the very implication that I might be blessed to be the answer to this prayer of Jesus found in St. John‘s Gospel 17:20-26, speaks volumes to me. Abba Isaac is telling us how we become the answer to that prayer. In other words, “when every love, every desire, every effort, every undertaking, every thought of ours, everything that we live, that we speak, that we breathe, will be God,,”. In these words, is a pure act of faith by letting go. A letting go of control, desire and every faculty of our being, to be replaced and used by God. Wow! What Abba Isaac wrote about is exactly what happens in contemplative and centering prayer. It is the experience of Mary in the words of the Magnificat. “My soul proclaims the greatness of the Lord, my spirit rejoices in God my Savior,,,” The experience of the presence of God is so abundant, that every fiber of our being becomes that presence of God. Abba Isaac tells us that the grace in contemplative prayer is evident when God becomes the reason we do anything and everything. Try contemplating that for today. 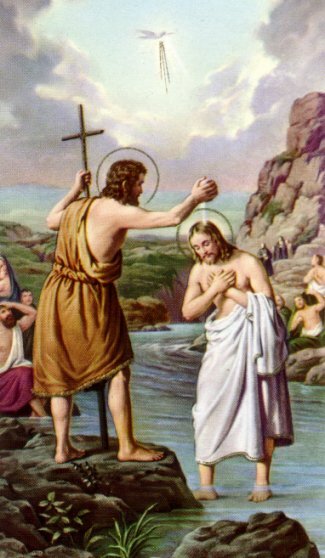 In those days Jesus came from Nazareth of Galilee and was baptized by John in the Jordan. And just as he was coming up out of the water, he saw the heavens torn apart and the Spirit descending like a dove on him. And a voice came from heaven, “You are my Son, the Beloved; with you I am well pleased” (Mark 1:9-11 NRSV). For when the Savior is washed all water for our baptism was made clean, purified at its source for the dispensing of baptismal grace to the people of future ages. Christ is the first to be baptized, then, so that Christians will follow after him with confidence. (The Liturgy of the Hours, Volume 1, Advent and Christmas Seasons, p.612). At Christ’s Baptism, our identity as Christians was bestowed on us in the Person and action of Jesus. Even more so, by the Holy Spirit descending and the voice from heaven that said, “You are my Beloved; with you I am well-pleased.” In God’s own words that proclaimed Jesus, God’s Incarnate Word; as God’s Beloved; with whom God was well-pleased; are also bestowed upon all of us by our common Baptism into the life of Jesus. It does not matter what we have done in the past. Those labels that others use to divide and define us, are meant to stamp us out for what we are. God welcomes us to live into who we are, and who we are to become. That is just something much too wonderful not to contemplate. And he [Jesus] called to him his twelve disciples and gave them authority over unclean spirits, to cast them out, and to heal every disease and every affliction. The names of the twelve apostles are these: first, Simon, who is called Peter, and Andrew his brother; James the son of Zebedee, and John his brother; Philip and Bartholomew; Thomas and Matthew the tax collector; James the son of Alphaeus, and Thaddaeus; Simon the Zealot, and Judas Iscariot, who betrayed him. (Matthew 10:1-4 ESV). I don’t know about you, but every so often I need an affirmation. I am a Monk in training. If I am completely upfront with others and myself; when and if I make solemn vows, I will always be a Monk in training. We all have a lot to learn. As I read these words from St. Matthew’s Gospel about Jesus calling His Apostles, I am encouraged and affirmed. Jesus calls them all by name. Jesus wants to impact the world so much through us, that He calls us each by our name. Whether we are female or male or any other useless label humankind heaps upon us. “….. for all of you are one in Jesus Christ our Lord” (Galatians 3:28b NRSV). Jesus calls us by our name to live into who we are, not what we are. In Jesus, we are called by name as God’s beloved, with whom God is well-pleased. (See Matthew 3:13-17). God tells us through the Prophet Isaiah: “Do not fear, for I have redeemed you; I have called you by name, you are mine” (43:1b NRSV).